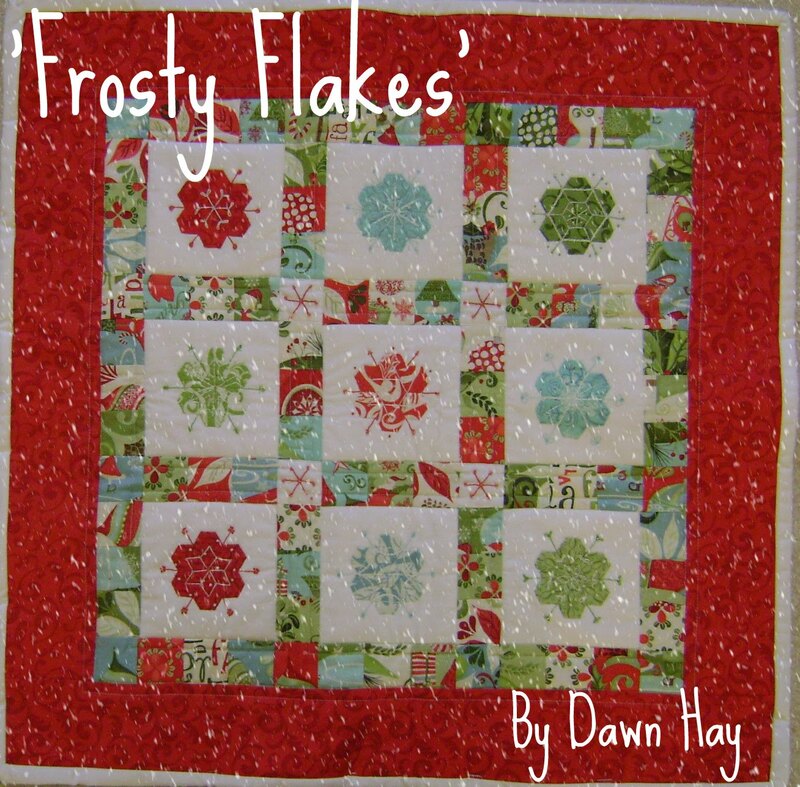 As sweet as cinnamon: Frosty Flakes - The Quilt! I used a wider than I normally do and white but it looked the best. also some little stitched and beaded stars in the middle corners. I can't wait to put it up at Christmas... maybe a little sooner..
How is your little snowflakes coming along????? But here are the links for the ones already released. Block Six, Block Seven, Block Eight. WOW,what a "fun" week at the ER........glad both of your girls are doing better!! Quilt looks DREAT!! Can't wait until the rest of the flakes fall our way :)! Thank you for the design... and I'm glad your girls are OK! Looks great Dawn, so bright and cheerful. Thanks for sharing the pattern. Hope your 2 daughters are ok now.....J. Dawn , the quilt is just adorable and although I haven't started my blocks yet I am definitely going to .Hope the childrens injuries are on the way to healing . Oh Dawn what a traumatic time you have had with your babies. I hope everything is okay now? The quilt looks FAB !!!!! Love it !!! Oh Dawn two trips to the ER??? My goodness you must be exhausted! I hope they're both ok! Your quilt is just too darling not to hang year-round, girl - it's just gorgeous, I love the colors and design!! I love your quilt. Hope all is well in your household now! I am truly sorry I have removed an earlier remark I left, right under my first comment. Someone left me a note about it, took me a while to relaize what they were even talking about. But I think this was the only place I left a message or two today. My second comment was supposed to be about MY first comment. I meant MY bad typing, because I wrote DREAT not GREAT.... I am always adding word misspelling, leaving words out, puncutaiotn etc because of my typing...........that remark was about my typing not Dawn's. But I realize the way it read was like I was saying she had bad typing. NOOOOO, just ME!! Am truly sorry Dawn, I was NOT was referring to yours!!!! I really need auto spell check! no probs Cyndi, I have always understood cos I am the same with my spelling mistakes... he he... I knew what you meant..
Wow... I'm glad that your girls are okay. A bit of a scare... especially with her neck. Your snowflakes look gorgeous!! Well done! Why must our children scare us like that? Hope they are on the mend now. 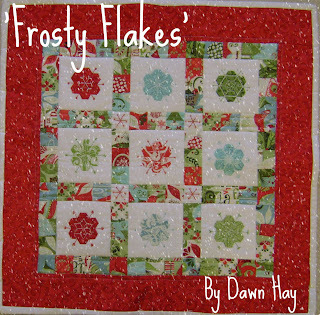 'Frosty Flakes' is so cute and Christmasy. !Que bonito queda el quilt! Estoy impaciente por el copo nº 5. Gracias. I love snowflakes so this is just right for me. The wall hanging is wonderful! I hope your family will feel better soon. P. S. I absolutely LOVE the finished quilt, Dawn. Oh my - your quilt is beautiful. Dawn, it looks just gorgeous, and I am really enjoying making them. Running a little behind on no. 4 but will keep up with them. Thanks so much. Doris.. Your quilt looks fabulous. I started it last night and can't wait to get really stuck into it now I've seen the finished project. Sorry to hear about all the medical dramas. Hopefully you have the trips to the ER out of the way for a while. Absolute sparkly goodness. Love your snowflake quilt. Love the BOM. Thanks for all you do! It's absolutely beautiful, Dawn!! So pretty!!! Thanks for sharing yoursnowflakes they are lovely. Hope your two girls are ok.
Glad hear your kids are well. sorry to hear about trips to the hospital. Hope all is good now. Love the little hexi's. Hope I spelt that right! Oh WOW!! This is a beautifully cute design Dawn!! And Thank you! Block 5 is delicious! So sorry to hear about the trauma of the visits to ER with your two DDs...Don't they just worry you grey! Good luck with your son's wedding! I hope all goes well for you all. But you don't look old enough to have a son old enough to be getting married! Oh Dawn - it's gorgeous! Love it, love it! Great design - and so sweet of you to share! !